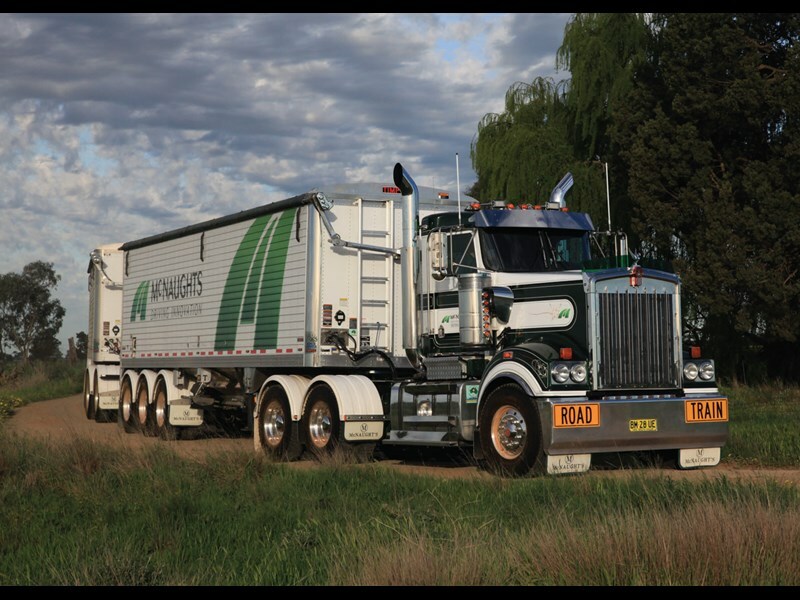 The McNaughts operation, based in Finley, New South Wales, revolves around bulk haulage, primarily rice, grain and fertiliser. It has a crew of reliable, experienced drivers at its disposal. 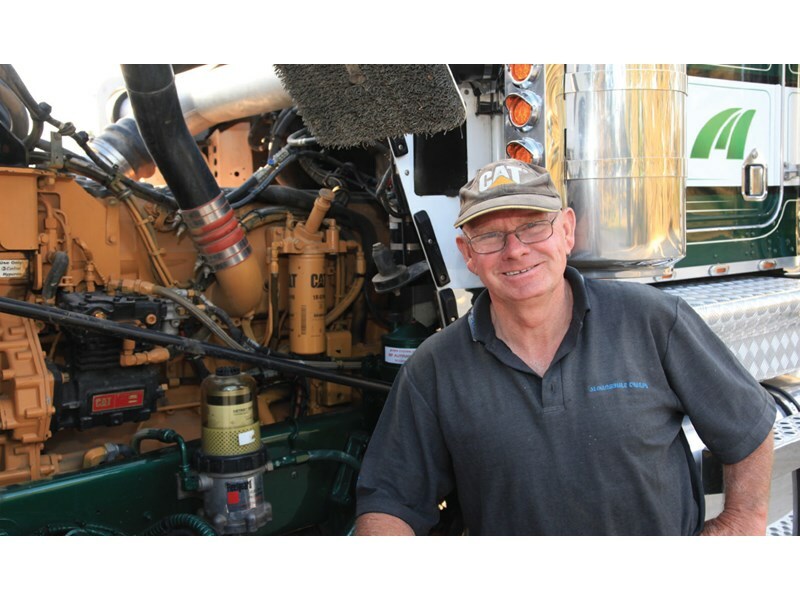 We caught up with one of the McNaughts’ drivers, Paul Healy, in nearby Berrigan and discovered that it was the attraction of driving a Kenworth T904 that lured him back to the fold. "I’d previously driven for McNaughts for 11 to 12 years, but had four years off. I’ve been back here for about 12 months," Paul explains. "They chased me around and asked me to come back, offering a T904 dumper road train and said I’d be home every night. "With this truck you can’t get any better; it’s got every comfort in it and it’s all operated by remote control." Like many drivers, Paul grew up around trucks with his father driving stock crates in the ’50s. "I was driving before I got my licence. The first truck was a little Dodge Fargo tray body then onto Accos with 160 Cummins and a 1418 Benz. "Dad retired and I moved onto bigger and better. I have always worked locally with only a little interstate, but never full-time. "It was different in the early days and when you were younger. You didn’t mind how hard it was." As well as his liking for the Kenworth, Paul enjoys hauling the company’s belly dump Timpte Hopper trailers. Knowing his week’s schedule well in advance is another plus. "McNaughts will ring on Thursday or Friday, advising what will be the following week’s run," he says. "We all run at 90km/h; it’s the rules and regulations. Everyone knows us and if you do the wrong thing, McNaughts get a phone call. "In addition, we have satellite tracking and they know where we are and what we have done, but it’s all good. "Doing local, there’s no rush. We’re off the highway and don’t have time limits." In most cases, four trucks run from depot to mill, the drivers taking turns as to who leaves first. "There is no point rushing as you will only catch up with the bloke in front of you," Paul says. "We all know how long it takes to do the runs down to within five minutes … unless you get held up." 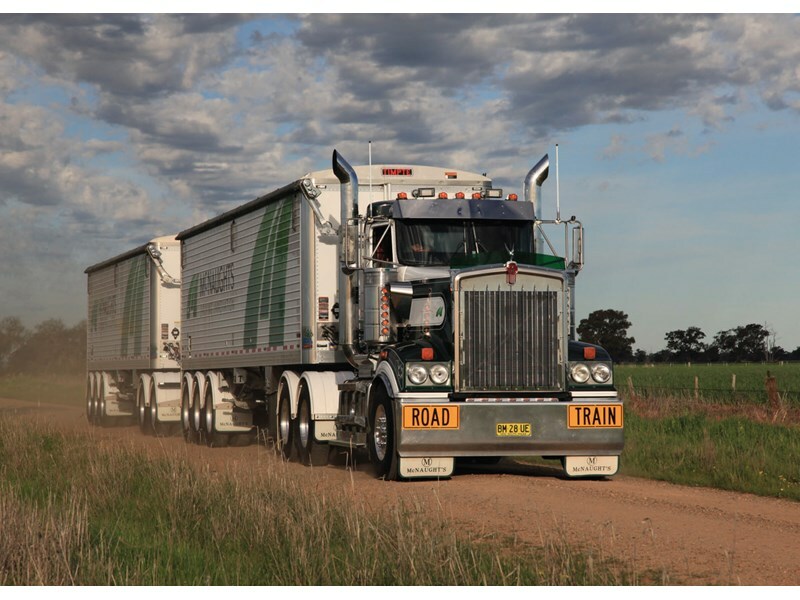 The workload increases during harvest season, with McNaughts’ trucks also hauling grain to the silos. That involves both B-doubles and road trains. "I go wherever they need me to go, it suits me fine," Paul says. "I don’t mind a bit of variety with a run down to Melbourne." On the odd occasion when Paul needs to stay away overnight, the company arranges accommodation. Generally though, it’s a 7am start, with the last load leaving at 5pm. On most mornings there are two trucks waiting to load and two to unload. The T904 is one of four ex-Ruttley Kenworths which McNaughts purchased and refurbished, the result being a very ‘fat’ looking Kenworth. "It’s a smart looking rig and it stands out," Paul says. "I’m happy to drive it, and it goes well with the Cat C15 up front." Two Timpte ‘super hoppers’ are a feature of the rig. The entire set-up tares at 23 tonnes, allowing for an 81 tonne gross. With dash monitored on-board scales, it’s easy for Paul to load to maximum weights. "Everyone knows we run legally and that the equipment is in top condition. 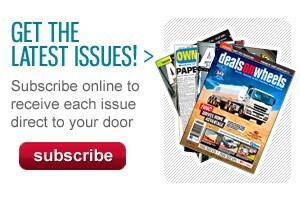 We aren’t permitted on grain sites overloaded these days," he says. To lighten the load, Paul doesn’t bother carrying a spare tyre or jack. If he encounters any problems, the solution is only a phone call away. In 2012 John McNaught was appointed Australian dealer for Timpte Hopper Trailers (as reported in Owner//Driver, September 2013). In the United States, Timpte is the most common agricultural trailer on the market, the company producing 25 trailers a week. 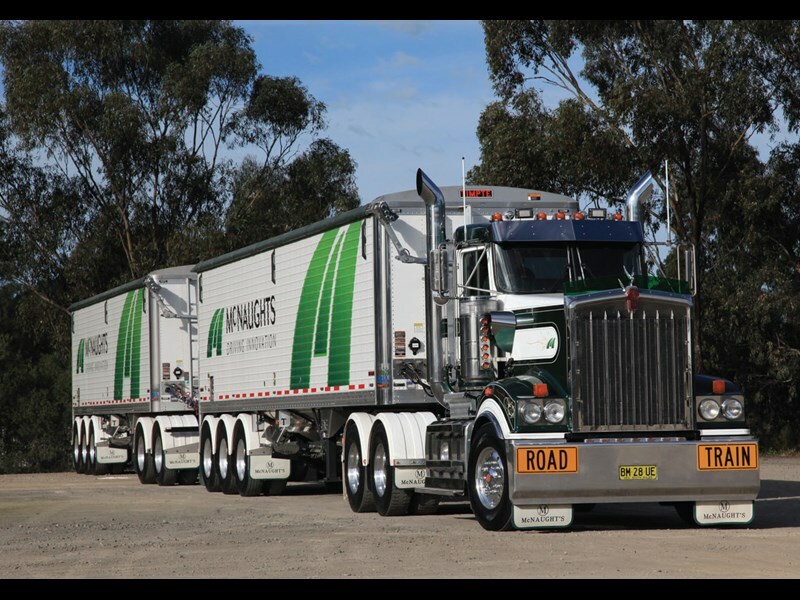 "McNaughts did throw them a bit of a curve ball when they wanted a road train unit as they had not experienced that before. So their engineers came over to Australia," Paul explains. 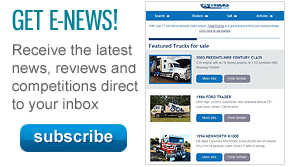 "They strengthened the trailers in various places and now providetrouble-free utilisation. "There aren’t as many moving parts in a bottom dump. Driving along, there aren’t any rattles or clanging either. They’re very different to tippers." Paul says with remote control access, the top rollover trap and the bottom doors of the trailers are easy to operate. "I don’t have to get out of the cab which is a big advantage. It’s all common sense really," he says. The Timpte trailers are brought over to Australia almost complete. McNaughts add the mudguards, wiring and any extras a customer may want. They can be configured into B-double or road train units with their big advantage being less moving parts and light tare weight. "Young blokes have got no idea how hard we used to do it. You would go out to a farm, back up to the shed or barn, then wheelbarrow off back to front. Then you would come home with another 20 tonnes that you hand loaded, lumping bags of super or loads of wool." Back then, Paul drove for Allan Baldwin Transport, which is also based in Finley. He started in a little S2 with a V671 engine and ending up driving a Kenworth Aerodyne with an 8V92. "When a young bloke came out to the yard, before he had even done a driving test, he was asked about his tarping experience. Then, with either Allan or myself, we would go out to a convertible, roll out the tarp and see what kind of job he could do. "If it was okay, then Allan would put him in a truck and go from there." 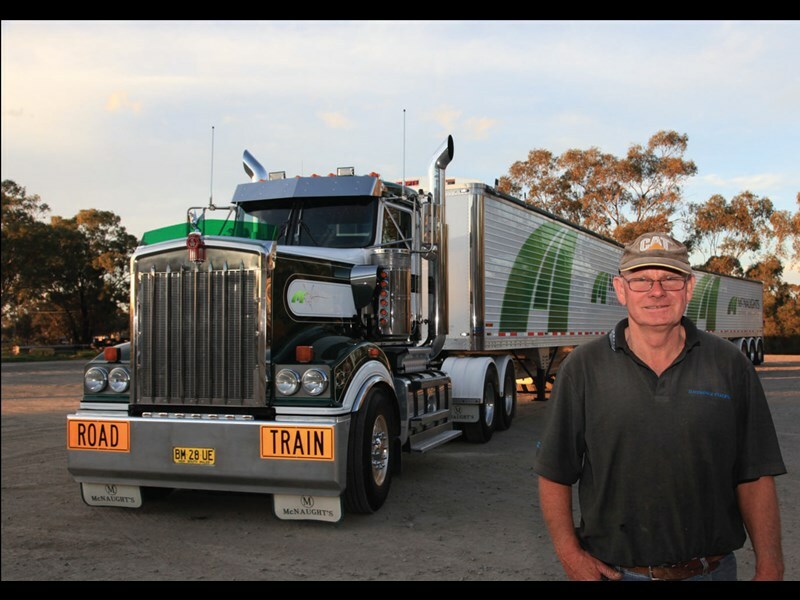 At McNaughts, Paul and fellow driver Jack Vogel are responsible for showing new recruits the ropes. It’s hands-on experience before they begin. "It’s like everything, you have to be taught, no matter who it is. And the belly dumpers are very easy to operate," Paul says. There are 28 trucks in the McNaught fleet; all Kenworths except for three Cat trucks and the most recent arrival, a Peterbilt. "The Pete is on trial to see how it goes when matched against the Kenworths. But I’m a Kenworth man and I wouldn’t swap this," Paul grins. "John gives us everything we need to look after the gear. There’s a drive-through wash if you want it but most of the drivers like to do their own cleaning. "However, if you have a big week or weekend, we just ask for the truck to be washed and it will be done. The same goes with the maintenance. "We don’t touch the truck, you just fill in the relevant paperwork and it’s all done." It soon becomes apparent that McNaughts have a liking for Cat engines. If there’s any engine issues, newly recruited mechanic Brian Latten can handle the re building when required. On the outside, McNaughts’ vehicles look the goods, especially with the new logos, as well as the white mudguards. "We originally had stainless steel guards. With all the sand blasting from the farm work, white mud guards were better and cheaper to fit than a plastic alternative," Paul says. "At least now, if a white mudguard gets a bit tatty, you can put on a new one for about $40 against around $150 for stainless steel." Paul, now 59, says driving local around the area is like being semi-retired, but he’s not the oldest driver at McNaughts. "We have one bloke who is 75 and another in his high 60s. The drivers of the four 904s are all in their mid-50s or 60s. "I’ve have been in the game all of my life and I will be for a while yet," Paul smiles. "This is the life for me."